Quality is essential! in every product, for every person who makes a purchase. A desire to have a reliable product that will last long and will not let you down at the most critical moment is always there. Here at Admiral it is our objective to save our Clients from problems related to quality. That is why we try to reduce risks of any failure in material or craftsmanship during production, perfecting our quality control system on the regular basis. We purchase materials from reputable suppliers well-known in the industry for their research and developments of products specifically intended for the boating business. We keep up with latest improvements and innovations introduced by the boating industry suppliers. We have the best specialists working at the Admiral Company, some of us have been making boats all our lives and we love it. Indeed we are passionate about what we do and want to share our products with people. We produce our boats in accordance with the latest developments and well-reputed technologies applied in the business. We constantly keep looking for novices in the materials market and search to implement innovative technologies in our production and quality control process. We inspect, check and test materials quality on the regular basis prior, during and after production. The products are controlled on each production stage to keep up with quality standards we set for Admiral boats. Final 24 hours inflation pressure test. All our boats are certified with Polski Rejestr Statkow S.A. and carry a CE-mark accordingly to prove the quality we offer. Unique high quality PVC coated special fabric, manufactured in Germany under the internationally recognized standard of quality DIN EN ISO 9001: 2008. 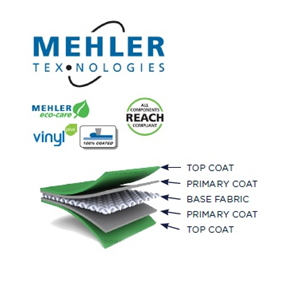 Several layers of PVC are combined with a Polyester base fabric of high strength 1100 dtex yarn by melt-roller coating. These single layers give flexibility, elasticity, airtightness and resistance against mechanical damage. VALMEX® boat is abrasion resistant, UV and weather resistant, and insensitive to high temperature conditions. VALMEX® plus products feature higher resistances to various environmental conditions due to an additional acrylic surface finish. TEXACOL М 100 PU.PVC – one or two component adhesive purposely designed for gluing synthetic materials: polyurethane and PVC. With its good initial tack characteristics this glue is extensively used in the boating industry. BS 1088 is a standard that is used by marine plywood manufacturers worldwide. For the floor, seats and transom we use plywood with a waterproof lamination specifically designed for boats and yachts. Marine grade plywood has no internal voids, and features consistent veneer thickness. Particular timber types with good life in a wet environment are normally specified for the marine grade plywood.